Privileged by its mild climate, soil quality, water abundance and excellent geographical location on the Tejo river waterfront, Oeiras has a long been an area of choice, either as a tourist destination or as a place where (increasingly more) people want to live. The evidences of this territory´s occupation date all the way back to prehistoric times, as is proof the Castro of Leceia site, the archaeological remains of the Roman period and rich toponymy left by the Arabs. As of the Portuguese Discovery period, Oeiras is also considered as Lisbon´s barn, the Tejo river bar´s defense is another of its commissions, and a major industrial center settles in, of which stands out the Fábrica da Pólvora Negra in Barcarena. On June the 7th of the year 1759, Oeiras Council is established by royal charter of King Jose I, with its jurisdiction entrusted to his Prime Minister Sebastião José de Carvalho e Melo, Marquis of Pombal and Count of Oeiras. Oeiras thrives in this period, which left us as a legacy the Palace oh the Marquis of Pombal, with is magnificent gardens and large experimental farm, regarded today as a National Agronomic station of strategic importance in the bio-sciences area. 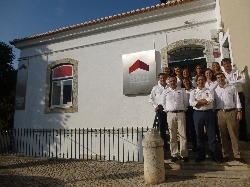 Nowadays, Oeiras is regarded as a place of strategic importance to Portugal, thanks to the innovation and competitiveness that made this county a kind of “Oeiras Valley”: Taguspark, Lagoas Park, Quinta da Fonte and Arquiparque are some of the major business parks in Oeiras and together host more than 200 companies in the areas of new technology and services. The wealth of the county is reflected in the remarkable development of leisure facilities, in its rich cultural agenda, on the beaches and the excellent accessibilities Oeiras has therefore been successively recognized as one of Portugal counties with the highest quality of life levels.